Honestly, I’m not sure how to write this review. I just love Jio’s books and her ability to weave the past into the present. 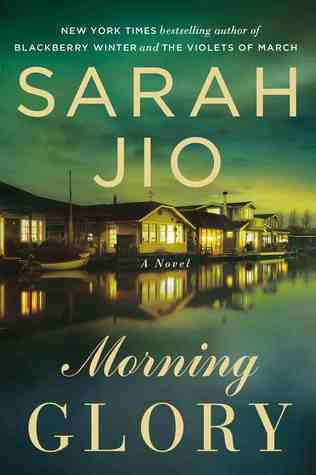 Even when I figure out the twist early, I’m still completely hooked.Morning Glory is yet another fantastic novel by Jio. Morning Glory centers around a houseboat in Seattle. In the present day, Ada is trying to escape the pain that has come to cover her entire life. In the past, Penny is trying to be the wife she thinks her husband needs while trying to be happy. The connections formed between the two, decades apart, are wonderful. Ada is an amazing character. She’s strong when others would have fallen apart, even though she can’t see that in herself. She isn’t sure if she’s ready to move on with her life and looks to her past for signs of her future. Alex is equally wonderful, giving Ada the space she needs, yet he’s there for her and understands that her past has helped shape her. He doesn’t try to be her world, but instead just wants to be a part of it. Their relationship was sweet and heartwarming, bringing me to tears a few times. Penny is a young bride that doesn’t feel like she fits in with her husband’s world. He’s a famous artist and devotes his life to his work, giving Penny time when he can. Penny tries to understand and be the wife he needs, but when Collin comes along and gives her the attention she deserves, things become tangled. I felt for Penny. She wants to be the perfect housewife, but she’s sacrificing herself in order to fit that mold. I admire her for trying to be there for her husband, but I also admire her for knowing when she’s losing herself and working to find herself again. The characters of Boat Street are amazing. They are what really make this novel shine. You know they are keeping a secret, yet they continue to act as though nothing is wrong. They each played a part in the past and unraveling their stories is just as interesting as the main mystery. Everything is important and the little clues Jio drops throughout the novel are delicious. Morning Glory is a fantastic novel about two women, decades apart, both struggling to find themselves again. There’s romance and mystery, all wrapped up in the quaint community of Boat Street. This novel will pull at your heart, give you tears, and make you smile. Once again, Jio has written a fantastic novel that definitely is a must read. This entry was posted in Contemporary, Historical Fiction, Mystery, Thriller, and Suspence, The Must Reads and tagged Contemporary, Historical Fiction, Must-Reads, Sarah Jio.